Home » Website Building » WordPress » How to Move Jetpack Subscribers to MailChimp? How to Move Jetpack Subscribers to MailChimp? Jetpack offers many modules to enhance the distribution of your content. Jetpack Subscription is one of such modules allow users to subscribe to new blog posts and comments on your site. This distributes the blog post immediately after publishing to individual inbox of the email subscribers. When your site is growing in size Subscription module is not sufficient to handle email campaigns. You will need more dedicated email marketing solutions like MailChimp. In such case, you need to move all existing subscribers to new platform. In this article let us discuss on how to move Jetpack subscribers to MailChimp platform. Login to your WordPress site and navigate to “Jetpack > Site Stats” section. Scroll down to end of the page to view the subscribed followers status of your site. You will see two counts under “Followers”. Number of people subscribed to receive comment updates. You can neither see nor download the email ids of the people subscribed to comments. You can only download the email ids of the people who are subscribed to receive blog posts. WordPress.com followers who follow you on WordPress. You will not be able to see or download the email ids of WordPress.com followers. Email-only followers – this is the list you can download. Scroll down to end of the page and you will see an option like “Download all email-only followers as CSV”. Click on the link and the subscribers list will be automatically downloaded to your computer. If you are not connected to WordPress.com then you will be prompted to login before the download starts. The list will contain all active subscribers to your blog. Users not activated the subscription and unsubscribed from the distribution will not be part of the downloaded file. Now that you have the list of active subscribers to your blog and the next step is to upload the list to MailChimp list. Login to your MailChimp account and click on your list under “List” tab. Go to “Import subscribers” option available under “Add subscribers” tab. Choose CSV file upload option and click on “Next”. Upload the subscriber list file from Jetpack to MailChimp. 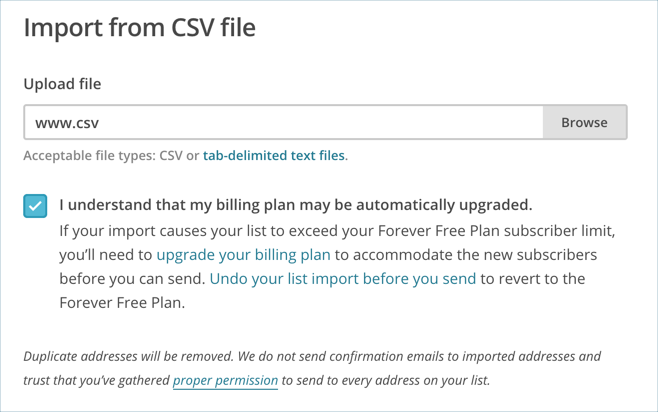 You need to agree for the billing plan upgrade as MailChimp charges based on the number of subscribers. If the upload increase your subscribers list then the your MailChimp account will automatically get upgraded accordingly. The next screen will give you some options on the import like categorizing the new subscribers. 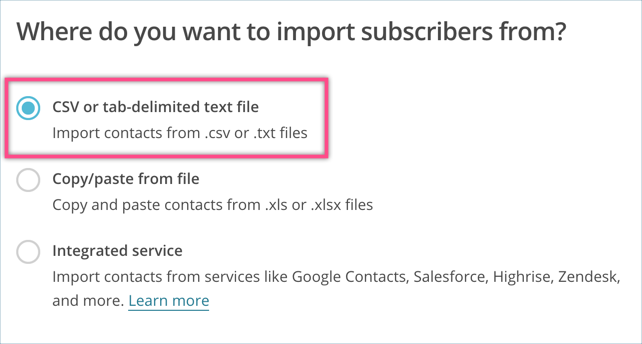 MailChimp will automatically remove the duplicate entries by comparing your existing subscribers and sync new subscribers to your existing database. The importing may take some time based on size of the file and your import settings. Once the import is completed all Jetpack subscribers will be uploaded into your existing MailChimp list. You can create a campaign and send emails to those subscribers. Ensure to disable Jetpack Subscription module and remove the signup forms after migrating to MailChimp. You can also only disable blog post subscription and continue to use comment subscription. In such case new users can’t subscribe with Jetpack but those subscribed previously will continue to receive the blog update emails. Hi there, I’m so happy I found this post as I was having issues with the subscription. Only to find out that both my jetpack and Mailchimp pop up were activated. This led to new subscribers not getting confirmation. My question is: Most of my followers are from the WordPress.com site and I just had a few from my email list followers. I understand I can only download the email list. But once I have migrated to Mailchimp and disabled the Jetpack subscription plug in, will my WordPress followers still receive notifications of my blog posts? How can I migrate those followers to Mailchimp? Please advise. Thank you. When you disable Jetpack subscriptions, the subscribers will not get the notifications. You can test this by subscribing to comment on your site, disabling Jetpack and then enter a comment. Our web developer imported our list to MailChimp but did not disable the JetPack subscription module. We wanted to allow readers to “follow comments”. This went unnoticed until just recently. The developer is no longer available to us, and I’m trying to figure out if any of our “email followers” from the past year and a half are on our MailChimp List. Got any advice? You can only allow users to subscribe to comments, however you manually need to sync the emails with MailChimp. Thanks for your post! How do I disable the Jetpack subscription module? Go to “Jetpack > Settings” and disable the subscriptions option under “Discussion” section.